An eight-year-old boy is hoping to raise £10,000 for charity by taking part in a 23-mile walk across London. 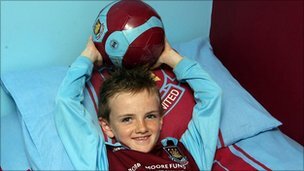 Jonjo Heuerman, from Kent, will start on 25 February from Wembley Stadium and finish at West Ham's Upton Park ground. He hopes to arrive on the pitch's centre circle just before the Hammers' clash against Liverpool on 27 February. It is in memory of his grandmother, Lynda Heuerman, and former West Ham and England captain Bobby Moore, who both died from bowel cancer. During his walk across six London boroughs over the course of three days, West Ham fan Jonjo will pass World Cup-winning Moore's childhood home in Barking, east London. Jonjo, from Wilmington, will be joined by his father Gary, mother Donna and sister Megan. His mother said: "Jonjo and his sister were both very close to their nan and were devastated when she died, aged just 60, in February 2008. "Megan started the fundraising. She raised £9,500 in memory of her nan last year. "Jonjo wants to beat that amount and so is aiming for £10,000. "Now we are worried what Megan might do next to beat that. This time they are raising money for the Bobby Moore Fund which is a great cause. "Their nan would be very proud of them." England captain Rio Ferdinand, jazz musician Jamie Cullum and singer Pixie Lott have backed Jonjo in his challenge, and many more follow him on Facebook and Twitter.